Orlando Williams could only think of what might have been after the Colonels came up short against KU. ST. LOUIS — Orlando Williams didn’t see it with his own eyes. So he had trouble even believing it at first. "I heard everybody talking about Duke lost, Duke lost," said Williams, a senior guard for Eastern Kentucky. "I was like, to who?" That would be No. 14 seed Mercer. "That shocked me," Williams said. Williams’ teammates watched Mercer’s stunning upset of No. 3 seed Duke before leaving their hotel on Friday. That was all the affirmation the No. 15 seed Colonels needed going into their NCAA Tournament matchup against second-seeded Kansas at Scottrade Center. "We watched the end of the game right before we left the hotel, so we knew a high seed had already been knocked out," Colonels senior guard Marcus Lewis said. "North Dakota State beat Oklahoma yesterday and we saw that. So we definitely knew that this was reality and we could definitely win this game." Said junior forward Eric Stutz: "It inspired us because we knew that could easily have been us out there. We tried to put ourselves in their shoes and know that we could do the same thing. It gave us confidence." For much of their 40-minute showdown with the Jayhawks on Friday, the Colonels looked like they just might be the next giant slayer to come out of college hoops obscurity and knock off a No. 2 seed. The next Florida Gulf Coast. The next Lehigh. The next Norfolk State. But this is the other side of March Madness, away from the TV cameras and bracket busters and the pomp and circumstance of One Shining Moment, where the losing players sit in a cramped locker room and search for answers about where it all went wrong. This is March Sadness. This is where dreams go to die in just 40 minutes. Eastern Kentucky led by as many as nine points in the first half and led for more than 21 minutes in the game before Kansas imposed its will on the offensive boards and pulled away in the final minutes. Seven No. 15 seeds have taken down No. 2 seeds over the years, from Richmond beating Syracuse in 1991 to Florida Gulf Coast taking out Georgetown last year. It’s happened three times in the past two NCAA Tournaments. Kansas has won this thing three times already, MVP Clyde Lovellette’s squad in 1952, Danny Manning’s in 1988 and the 2008 group led by Mario Chalmers, Brandon Rush and Darrell Arthur. The Jayhawks have blue chips and lottery picks and a coach in Bill Self who makes nearly $4 million a year. 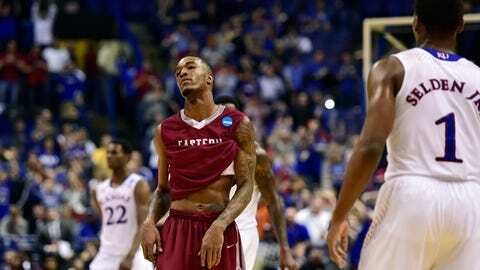 Eastern Kentucky has never won an NCAA Tournament game. The Colonels have a leader scorer, senior guard Glenn Cosey, who began his college career at Columbus State Community College — I’d never heard of it, either, but Google says it’s in Columbus, Ohio — and a 6-foot-8 junior forward, Stutz, whose long hair makes him look like he should be playing for an ’80s rock cover band at the team hotel. The Colonels will remember this forever, the day they could’ve, would’ve, should’ve knocked off big bad Kansas. They’ll tell their kids about it. Their grandkids. "We felt good as an underdog," Lewis said. "(Mercer) helped us. They are the same type of team we are. They played hard throughout their conference tournament. They beat a very good Florida Gulf Coast team that made it to the Sweet 16 (last year). So we felt like if they can beat Duke, we can beat Kansas. No doubt." This was an Eastern Kentucky team that won 24 games, including 11 in the Ohio Valley Conference. The Colonels had won seven straight before Friday’s contest, including an upset over top-seeded Belmont to win the OVC Tournament and earn the automatic berth in the Big Dance. Mercer’s upset gave them hope. "That put us in the mood to come out here and do what we’ve been doing all year, compete to the highest level and try to shock the world," Williams said. "We had the momentum for a majority of the game and we just came up short." Still, the Colonels will have a hell of a story to tell down the road. "It was a good game," Lewis said. "I felt we played good as a team. We just didn’t come out with it." Lewis said he will always remember how hard he and his teammates played, how hard they fought. These guys will be his friends for the rest of his life. He’ll go into battle with them any day against anybody. Yeah, it will be a great story for them to tell their kids one day. "I’ll tell them with all the hard work we had and perseverance, we were in a great position to upset one of the best teams in the country," Williams said, "and with a little bit more fight and a little bit more effort, we would have shocked the world."